I took my inspiration for this card from this week's Less Is more challenge, which is to use a butterfly or butterflies in your creation. I embossed the frame on Gina K's Pure Luxury White cardstock. This Provocraft EF is made for CAS creations! 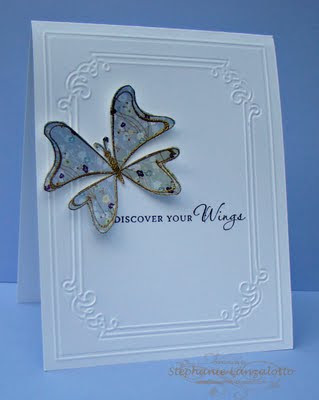 The butterfly from Taylored Expressions Discover Your Wings collection is heat embossed with gold embossing powder on a sheet of BasicGrey Wisteria DP then cut out and mounted on the card with 2 mini glue dots. The sentiment is stamped with VersaFine Onyx Black ink. I thought about adding a line of tiny purple rhinestones beneath the word "wings", but I resisted the temptation and left it very clean and very simple. I like it a lot! This is absolutely gorgeous - the simplicity of the frame allows the beautiful butterfly to shine!! Lovely! I like it a lot too Stephanie! Gorgeous, love the ornate butterfly. I literally GASPED when I saw your card on my blog reader. Perfect and beautiful. LOVE this! I just discovered your blog, I have to say this card is gorgeous. I hope you stop by my blog and follow me as well. Hi Stephanie, that butterfly is beautiful. It looks wonderful framed with that embossing folder. I've left you a blog award on my blog. Don't worry if you don't 'do' blog awards. I know some people don't, but I wanted to include you because your card are so lovely. This is truly a beautiful card! Wow that butterfly really stands out with the white card and embossed frame. Thanks for stopping by my blog. I am sooo following your blog. Hi again I forgot to let you know that I have an award for you. I just love your blog. I love your card and it's simple elegant look. Your butterfly is beautiful. Have to look for that embossing folder as it is a winner. Love that embossing folder! Stamping the butterfly on the DP was brilliant! How elegant and lucky that butterfly is! !